With the recent announcement of Tsuburaya Productions’ YouTube channel airing English-dubbed Ultra Fight Victory produced by William Winckler Productions, we sat down with the man behind it all to talk about the English-dubbing scene and his experiences working with Japanese companies. Could you tell us how you got involved with the English-dubbing scene? Well, I’ve always loved classic Japanese animation, Japanese live-action, sci-fi, fantasy, adventure, monster movies, etc., so when I began my career in the entertainment industry, it was only natural for me to go straight into working with Japanese studios. When I began my career in 1984 I was very young . . . only nineteen years old! I was the youngest producer of English language anime, and the younger producer of any TV series for syndicated television at that time! 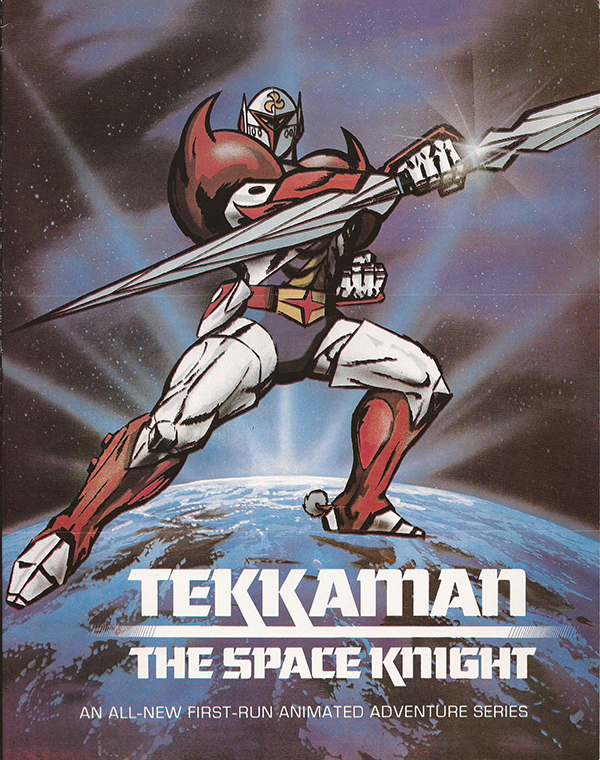 My first production was the American English dubbed version of Tatsunoko Production Company’s classic anime series Tekkaman the Space Knight. I have wonderful memories of working on Tekkaman, and although I was a small independent production company at the time, we managed to reach a huge kids TV audience in the U.S. and Canada from 1985 ~ 1989. In fact, the audience back then was bigger than the audience numbers for most of today’s major network prime time shows! Tekkaman did very well on home video too, with Congress Video Group selling a tremendous number of VHS video tapes. We produced Tekkaman in Hollywood at Bob Clampett’s recording studio, where Clampett’s famous Beany and Cecil cartoons were made (Clampett also produced many of the classic Looney Tunes cartoons for Warner Brothers. . . Porky Pig, Daffy Duck, Tweety Bird, etc.). Bill Hedderly Jr. who did the voice of Tekkaman/Barry Gallagher was terrific in the recording booth, jumping up and down, yelling his head off, as Tekkaman battled evil alien robots with his space lance! I’ll never forget how hilarious that was! How did you first get into tokusatsu? After Tekkaman the Space Knight, we were in discussions with various Japanese companies. One of the projects we were developing/discussing was an American English version of Tsuburaya Prods. Ultraman 80 series. The show was to be English dubbed, but due to censorship problems with American childrens television at the time, we would have had to edit certain violent scenes in each episode. People must remember that kids TV was heavily censored in the 1980’s, so when Ultraman 80 would decapitate a monster or something violent like that, we’d need to replace the unacceptable footage we removed with something else. In the original show there was a huge space craft, so in our English version, Adam West (Star of the original TV series BATMAN) would have played the role of a space captain orbiting Earth in that ship, detecting and reporting back to headquarters on whatever monster was about to attack. Adam West, essentially, would have been what Raymond Burr was to the original Godzilla film. Ultraman 80 would have been English dubbed, and Adam’s scenes would only have lasted for a few minutes in each show, including an intro, a middle scene, and an outro. Adam and his classic Batman were getting “hot again” at the time, there was “buzz” and talk of an upcoming Batman movie, so American TV stations would have taken the series due to Adam’s star power, coupled with the famous Ultraman brand name. It was a great idea, syndicated TV stations we talked to were very interested, and of course, Adam would have loved to have done it, and agreed to do it. Unfortunately, like some projects in development, our version of Ultraman 80 never materialized. However, years later, I did a lot of straight English dubbing work for Tsuburaya Prods. on big budget Japanese Ultraman movies. What was it like to work with Japanese production companies in the early days of English-dubbing? It was fantastic! You have to remember, not too many American companies were working with Japanese studios at the time. Prior to me, there was Fred Ladd, who is a very close friend of mine. Fred, of course, is the man responsible for first bringing anime to America in a big way for mainstream U.S. TV, with hits like Astro-Boy, Kimba the White Lion, and Gigantor (in fact, I also work as toy/merchandise licensing agent for the classic Gigantor for Fred’s company. We recently licensed the Funko Gigantor Pop! Vinyl figures and the larger Funko Hikari figures). The late Peter Fernandez who was the writer/producer/director and star voice actor of Speed Racer was also a friend of mine, and Corinne Orr (voice actress of Trixie, Spritle, etc. in Speed Racer) are like family to me! I love Corinne and see her often in New York. Both Peter and Corinne also worked on English dubbing Godzilla, Ultraman, Gamera, etc. .
Sandy Frank had a huge hit with his English dubbed version of Gatchaman titled Battle of the Planets, which was a multi-million dollar mainstream kids TV success. No other Gatchaman version ever came close to the huge, worldwide financial success Sandy Frank had with Battle of the Planets. The show’s writers/directors, the incredible voice talent (Casey Kasem, Janet Waldo, Keye Luke, etc. 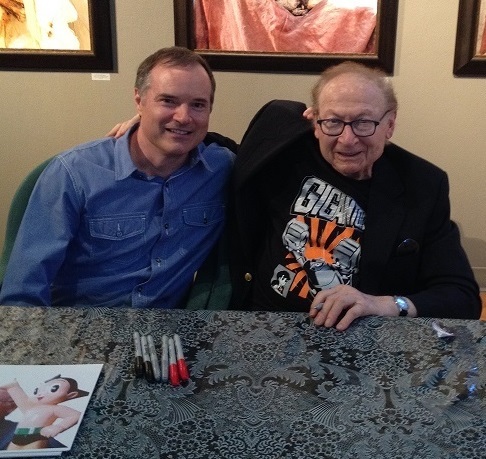 ), and music composer Hoyt Curtin, all originally worked for Hanna-Barbera in Hollywood. These people were some of the greatest talents working in kids TV at the time. I recall the late Carl Macek produced Robotech after I completed Tekkaman. All the anime distributors/licensees working today came later. They did not exist when I was making Tekkaman. Therefore, many Japanese studios and production companies were very interested in working with me. They would pitch me shows, series and films. Several of the companies, including Tsuburaya Productions and Tatsunoko Production Co., Ltd., were family run businesses! They were not big, huge corporations run by committees. When I cut the deal for Tekkaman, Tatsunoko president Kenji Yoshida himself agreed to and signed the contract directly with me. He gave the “green light.” There was an in-house licensing director who spoke English, Koki Narushima, and an intermediary named Ike Ashida, who was a great man . . . but still, you were dealing with a family run business. The top man made the final decisions. In fact, Kenji Yoshida loved what we were doing, and at one point, he offered the entire Tatsunoko anime library to Winckler Prods.! Yoshida-san was a very kind, warm, creative man! Many Japanese businessmen loved playing golf at the time, and I played a round myself with Kenji! We had fun! Of course, today the Yoshida family no longer owns Tatsunoko (Tatsuo and Kenji have passed on, although Ippei Kuri is still with us, lecturing/teaching). Most smaller studios or family run production companies have been gobbled up into major Japanese corporate entities. Remember, all the shows that were English dubbed at that time were intended for mainstream audiences of children. We’re talking tens of millions of kids. The Japanese studios wanted more than the incredibly small, niche audiences of U.S. teenage/adult fans (American Otakus). They needed bigger audiences. The Japanese producers wanted mainstream American kids in the tens of millions, and that’s what you essentially got when you sold to TV back then. During the 1980s there was little cable TV, no internet, no iPhones, no YouTube, nothing! If you wanted to watch something, you essentially watched TV with limited kids programming or you went to the movies. That’s a major difference between then and now. The audience today is splintered into millions of little pieces. I believe the Japanese studios and production companies were definitely more creative artistically, and although merchandising was always important, the films and series were not entire toy commercials. There was artistic integrity in all the fun shows, with new, fresh, original ideas being produced all the time. Japan’s economy was booming in the 1970’s ~ 1980s and businessmen were eager to break into the U.S. market. They poured lots of money into their productions. The executives were enthusiastic, optimistic, ethical and highly intelligent. They had talent and took creative risks, and many risks paid off. TV ratings in Japan were high . . . incredible numbers compared to today. Another interesting point is during the analog years, we were working with film! Actual film stock! 16 mm film prints. 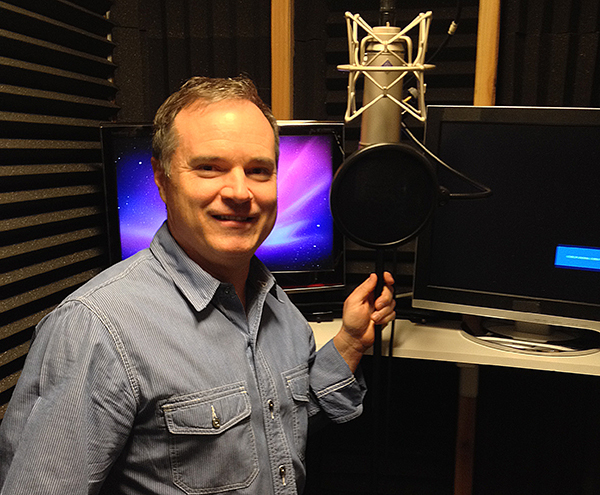 The entire English dubbing process was very different from what we do today digitally! I recall editing Tekkaman film prints on a moviola! If you break down all the anime dubbing I’ve done, the compilation feature films, the many pilots, etc., I’ve actually written, produced, directed and did voices in over one-hundred and sixty half-hour episodes! I’m a professionally trained actor, and when certain roles fit my voice range, I’ll do them. I was taught acting and directing at UCLA by Hollywood director Don Richardson, who directed over eight hundred television shows, Broadway plays, etc.,. Don taught famous stars like Anne Bancroft, Zero Mostel, John Cassavetes, Elizabeth Montgomery, Grace Kelly, etc.. He taught an alternative to method acting and was another genius! How did you first get in contact with Tsuburaya Productions and what changes have you noticed from working with them over the years? Years after the Ultraman 80 idea, I was doing a lot of work for Toei Animation, making many English dubbed movie versions of Gaiking, Danguard Ace, Starzinger, (available in the U.S. on Shout!Factory DVD) and around thirty other films. I was working for other companies too. . . HappiNet, Capcom, Digital Frontiers, Kyoto Animation, Production Reed, Atomic Monkey, NHK, Bandai-Namco, WowMax, etc.. I also wrote and directed the American English version of Capcom’s live-action horror movie Zombrex: Dead Rising Sun, based on the famous zombie video game Dead Rising. It’s an English dubbed “1980’s style” Japanese horror film from Keiji Inafune, the creator of Mega Man. Our English dub of Dead Rising has been seen by millions all over the world! My longtime friend Bob Johnson . . .and huge Ultraman fan . . . introduced me to Jun Yokoyama, who was head of Tsuburaya’s international licensing. Yokoyama-san knew of my extensive track record in English anime, and my live-action dubbing work on Dead Rising for Capcom. Tsuburaya was very interested in English dubbing their classic film library, and Yokoyama-san and I communicated back and forth for a long time. He became a friend, and we would often visit when he was in Los Angeles. Finally, when I was in Tokyo on business, Yokoyama-san invited me to dinner, and basically asked me if I’d work for Tsuburaya Prods. in English dubbing their bigger, more “high profile” movies. I agreed to do it, and looked forward to producing them. © 2016 UX Film Partners / Tsuburaya Prods. Co., Ltd. . I wrote, produced and directed the English versions of six (6) Japanese Ultraman movies. Five of the films were major, big budget theatrical motion pictures, including the Warner Brothers Japan title Mega Monster Battle: Ultra Galaxy, Ultraman Zero: The Revenge of Belial, Ultraman Saga, Ultraman Ginga S The Movie, and the special 50th Anniversary film of Ultraman, Ultraman X the Movie. The sixth movie was a TV special titled Ultra Fight Victory, which is currently being broadcast on the Tsuburaya YouTube Channel, “serialized” in short episodes. These are all the definitive English dubbed productions . . . Tsuburaya Prods. owns all rights and copyrights to my work forever, in perpetuity. We orchestrated a successful, limited theatrical release of an English dubbed Ultraman movie “double-feature” consisting of Ultraman X the Movie and Ultraman Ginga S the Movie. The theatrical screenings played in close to fifty (50) movie theaters in 2017 in most major, key cities throughout the U.S. and Canada. Movie theater audiences loved the English films, and screenings at theaters like the Chicago Music Box Theatre were big hits . . . with audiences cheering and loving what they were seeing on the big screen! You just don’t get that kind of incredible audience reaction from kids and families with subtitled films! I think some of my very best dubbing work are those six Ultraman films. The Hollywood voice casting, my editors/recording engineers, the lip synchronization, the emotional performances, etc., all worked beautifully. Obviously our movie theater audiences, and now the Tsuburaya Channel audiences agree. I maintain a good relationship with Tsuburaya Productions, who are now run by some new executives. They currently have many different “irons in the fire,” including broadcasting our English dubbed Ultra Fight Victory. Could you tell us about your love for Showa era tokusatsu? Well, as a kid I loved the original Ultraman and Toei’s Johnny Sokko and his Flying Robot (Giant Robo)! They were fantastic! Each episode of Ultraman was like watching a mini, stand alone, monster movie! The same is true for Johnny Sokko. As I said earlier, I believe the greatest creative works in Japan happened during the 1960’s ~ 1980’s. New, fresh, original ideas . . . creative concepts for film and TV were produced then. I think Shontaro Ishinomori was a genius, just like the Yoshida Brothers at Tatsunoko were, and of course, the great Eiji Tsuburaya was a true artistic king! The people behind the cameras during the Showa era were creative artists. They were also heavily influenced by the “Golden Age of Hollywood.” For example, a Japanese action director in the 1970’s would have been influenced by classic Hollywood action serials, cliff-hangers and other films. They were influenced by the “cream of the crop.” Many of the classic Toei tokusatsu shows had action and scenes reminiscent of the old Republic Studios serials. You can also see they were heavily influenced by the Euro-Westerns or Spaghetti Westerns too. Casting was also different, in that so many leading Japanese male stars were like Japanese versions of Steve McQueen, and other classic 1960’s ~ 70’s leading men. If you look at the original Kamen Rider star Hiroshi Fujioka, he was essentially a tough, strong, masculine, leading male character . . . a traditional Hollywood action star . . . a Japanese version of Steve McQueen. He was not a “pretty boy” 16 year old J-Pop Idol! Fujioka-san was, and still is, a great role model for audiences. There’s something special about actual film stock too. Quentin Tarantino has been very vocal about this subject publically . . . shooting on actual film stock creates a unique texture, feel, look to movies and TV. The classic Tokusatsu shows have this same warmth, feel, texture, because they were shot on real film stock. If you take a look at ending scenes of many Tokusatsu shows and watch leading characters standing in front of beautiful sunsets, especially sunsets over Mount Fuji, you’ll understand what I’m saying! Shooting on film is magic. The classic anime, shot on film stock, also has this same warmth and feel. Contemporary anime looks like a computer made it, unless it’s some Hayao Miyazaki film. Sonny Chiba and his Japan Action Club ruled Japanese showbiz stunts. Remember, during the Showa era, there were no CG effects, no digital stunts, no “fix it in post!” All the stunt work and martial arts scenes were accomplished by brilliant martial artists trained at Chiba’s Japan Action Club. You just don’t see this type of stunt work physically done today. You don’t see a guy jump out of a second story hotel window, onto a lobby canopy, then onto the sidewalk to chop and kick the bad guys, then hop onto a moving truck as it races away . . . all while wearing a super hero costume and face mask he can barely see out of . . . all in one moving master shot! If that’s not pure stunt talent, I don’t know what is! The early productions also had endless car chases and stunts, motorcycle stunts, speed boat chases, helicopter action, etc..
What’s amazing is that you’d watch a scene where a hero is hanging hundreds of feet, dangling from an aerial cable car, and if you look closely at the master shot, it is the star himself doing the stunt! The actual star of the series is hanging out of the cable car way up in the air! This would be unthinkable today, with studio insurance policies, union rules, regulations, safety standards, etc.. Few TV stars today would have the guts to hang suspended from a cable car high above a mountain lake! All the pyrotechnics, explosions, blasts, etc., were filmed “live,” “in camera” too! Shot gun and machine gun blanks were used! Pure, fun, escapist entertainment! It was classic gold! What is the process like to create an English-dub of a Japanese production? I could write an entire book about the process of English dubbing, but in a nutshell, it is a dying art. I don’t believe many people can really do it, especially for Japanese live-action films. It has more in common with music composition and “listening to the music” of the Japanese language. I’m like a magician and music composer. I’m trying to make you believe that the characters you see are thinking the thoughts and saying lines in their natural American English language. I don’t want the audience thinking the film or anime is dubbed. The point is to hide the dubbing process, so you don’t even notice it. I’m faithful to the source material, yet at the same time, depending on audience specifics, I often have to “Americanize” or “Localize” it. I really am more of an artist, than a typical dubbing house cranking out thousands of hours of dubbed content each week. I don’t believe you get quality from a “factory” rushing out the work. It’s impossible to maintain high quality and excellent production values working that way. One of my Japanese studio clients said I was like a gourmet sushi chef making edible art, as opposed to a big, cold, emotionless business mass producing grocery store level sushi. For those interested in knowing more, feel free to check out an extensive on-camera YouTube interview I did for Old ClapperBoard Productions. It’s in multiple parts, but covers a lot of my career and the detailed process of English dubbing. 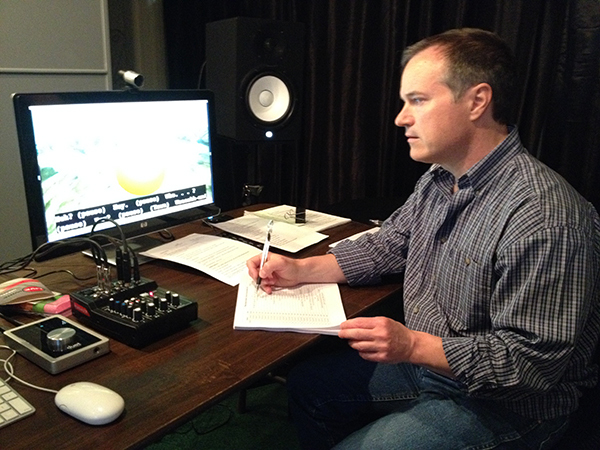 What struggles do you encounter during the English dubbing process? Without trying to sound immodest, I usually don’t encounter too many struggles. You see, everything hinges on my dubbing scripts. My scripts are near perfect and my voice talent study / rehearse their roles using my scripts days ahead of the recording dates. I’ve perfected my technique/system to the point that when voice actors arrive in the studio, and my recording engineers are behind the controls, and I’m there directing, everything works like clockwork. That having been said, it’s a little like putting together a five-thousand piece jigsaw puzzle! I don’t think audiences truly understand or appreciate how incredibly difficult it is to English dub any foreign film. Things get tricky when a room full of characters start talking simultaneously, at different speeds, doing different things vocally (laughing, talking, coughing, etc.). Anything that comes out of the mouth must be written in the dubbing scripts . . . even the specific number of pants a character makes while running! My dubbing scripts also have special notes, which give the voice actors instructions on how to deliver a line. For example, how long to pause, or when to speed up or slow down, or the proximity of the character one is speaking to, etc..
Children do not watch subtitled content. Period. End of discussion. Every TV network and film studio knows this. Therefore, for content intended for kids and families, the material must be English dubbed to reach the widest mainstream audience possible. For fans who prefer English subtitled content, that’s fine and nothing is stopping them from enjoying what they prefer. However, for the rest of the mainstream audience (the rest of the English speaking world), the shows must be dubbed. To be honest, many mainstream adults are very lazy and don’t want to “read a movie” or “read a TV show” either. It sounds crazy, but it’s statistically true. Quality English dubbing is important for many adult viewers too, not just for the kids. Yes, there are lots of projects at the moment, but I can’t go into further details yet. Some of the projects have nothing to do with English dubbing. I’m actually writing/developing a new tokusatsu film with a Japanese partner who worked on some major titles in the past. I’ve never been just a “one trick pony” and stuck solely to the dubbing business. I have produced my own, original independent film productions, TV pilots, etc., which I wrote and created.